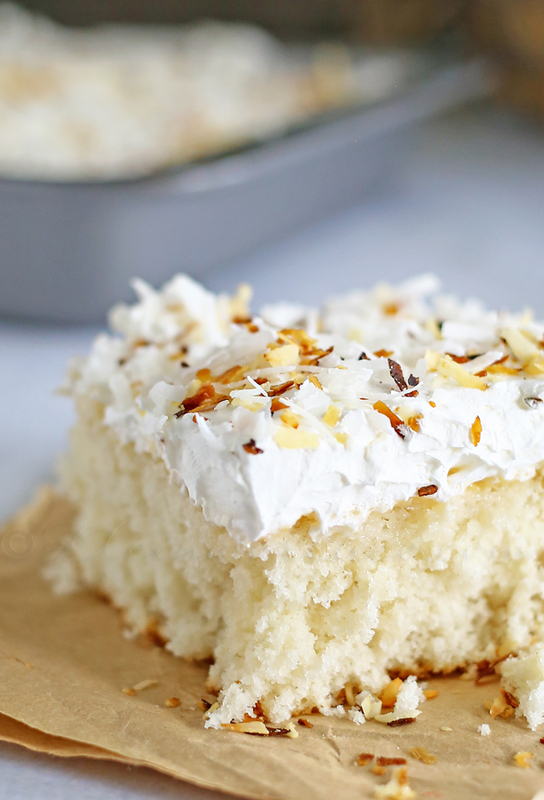 This Coconut Cream Cake is a coconut lovers dream. 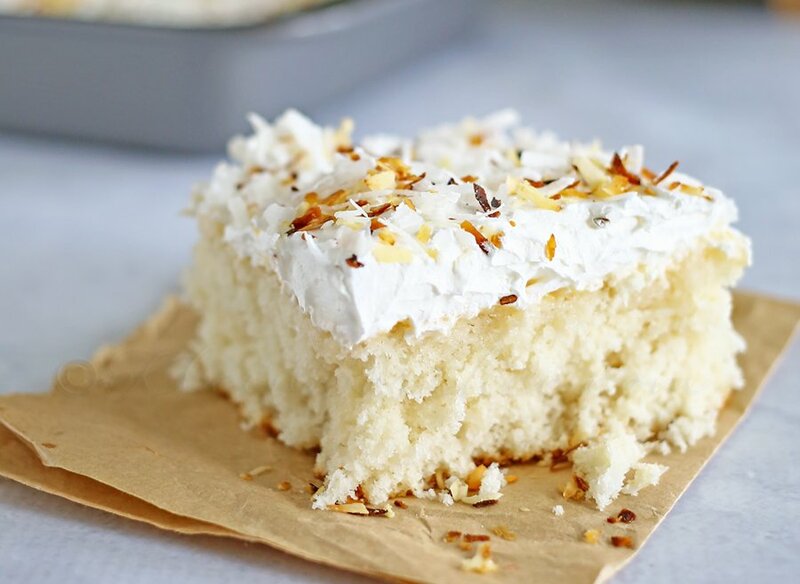 It’s easy to make & packed full of delicious coconut flavor! 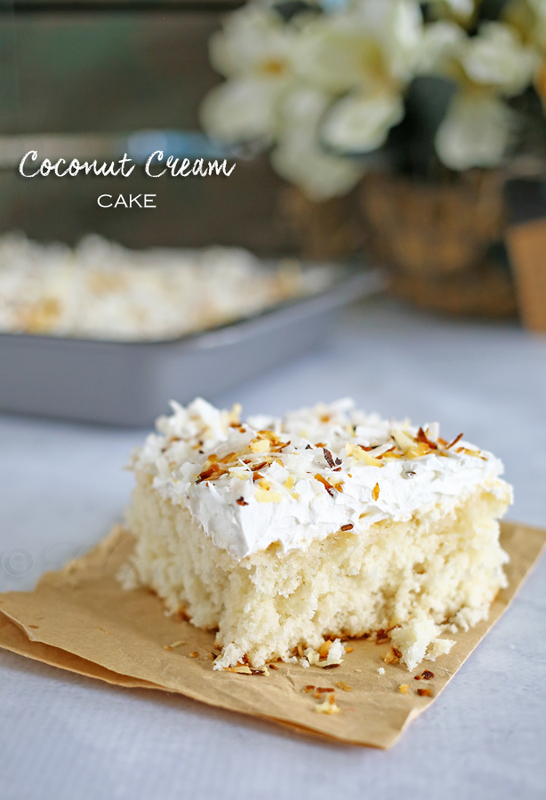 Light & fluffy coconut cake topped with creamy whipped cream & homemade toasted coconut makes this Coconut Cream Cake enjoyable from the first bite to last. One thing you probably know about me if you have been a reader here for any length of time is that I love coconut. It’s my go-to scent, flavor & everything else. I love it so much. It reminds me of sunscreen, which in turn reminds me of my home of So Cal. I think I’m drawn to it more because I rarely get a chance to get back home & so eating it, smelling it & enjoying it gives me that little piece of home I need. Aside from that it’s just flat out delicious. I’m absolutely addicted. 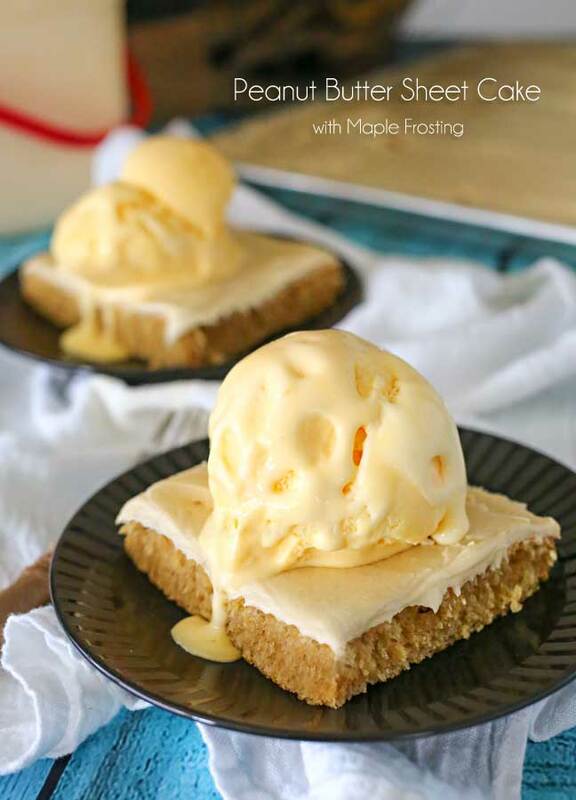 So one of my favorite things to make with it is a coconut cream poke cake. 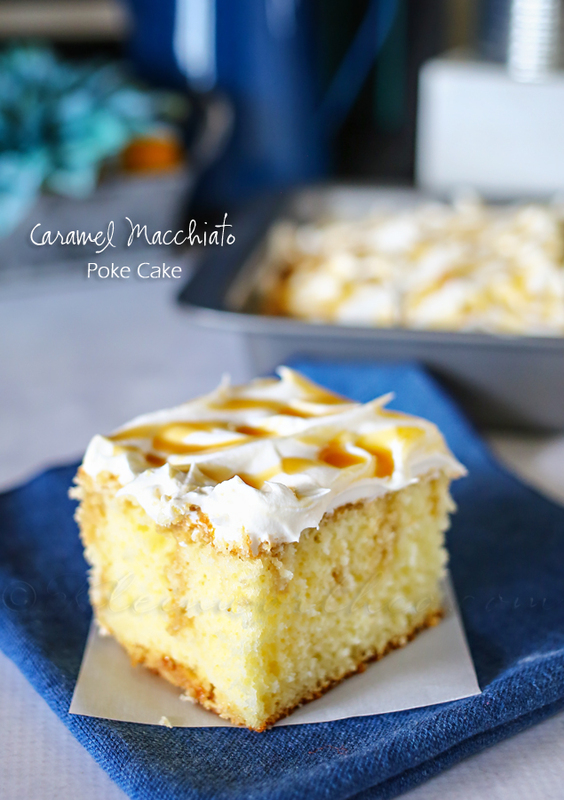 Have you ever made a poke cake before? It’s basically a regular cake, only you poke it full of holes & drizzle some sort of yumminess all over it & let it soak on in there. Before I made one my first thought was that it would make the cake soggy. Nope- it just makes it even moister & delicious. My mom was a professional cake decorator, so cake was an everyday part of my life. I literally can’t get enough cake & when you make it loaded with heavenly coconut flavor like this one it can make my eyes roll in the back of my head with every bite. I’m not going to lie, I had a hard time sharing this with the family. I could have sat there & devoured the whole thing in close to one sitting. 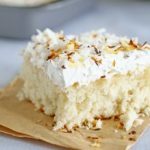 The wonderful flavor of light & fluffy white cake with sweetened coconut mixed in is enough to make me swoon. But then to drizzle cream of coconut on & top with whip cream & toasted coconut, well, it’s like heaven on a plate for a coconut lover like myself. 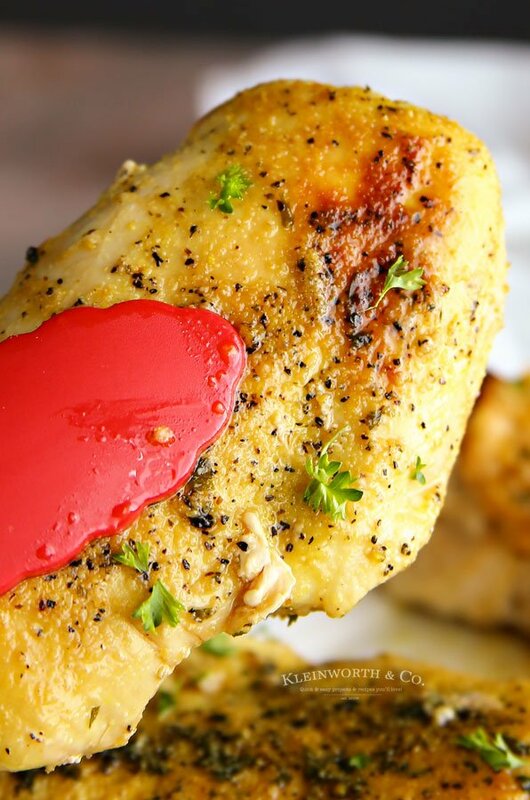 I love this recipe because of its versatility. It works well for the holidays because it’s white & pretty. But then imagine enjoying this some summertime too. Take a little piece to the pool or curl up with one next to the fire- regardless of the season, it’s a great recipe to make. Doesn’t that just look so delicious? 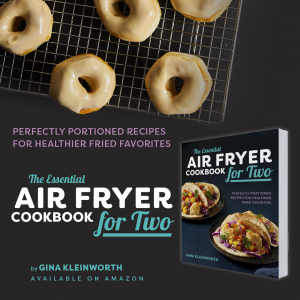 With as easy as it is to make – it will become your new favorite! 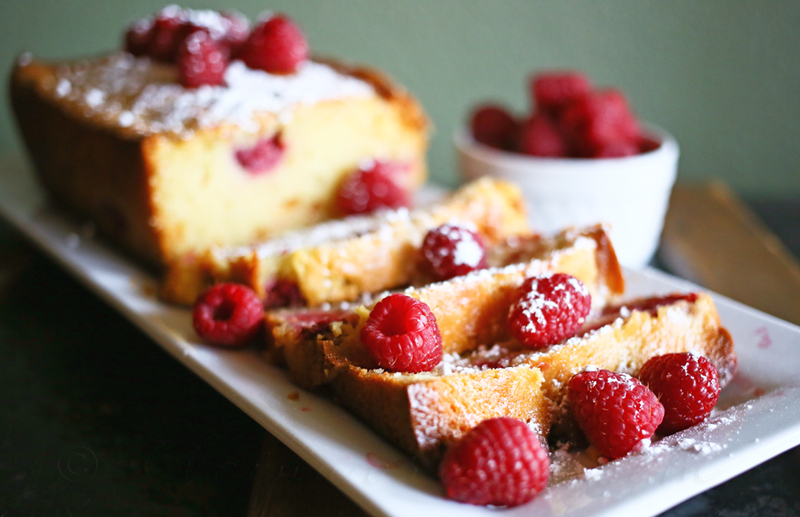 Looking for more great cake recipes like this Coconut Cream Cake?